At the start of the match on ESPN2 we all knew the stakes. 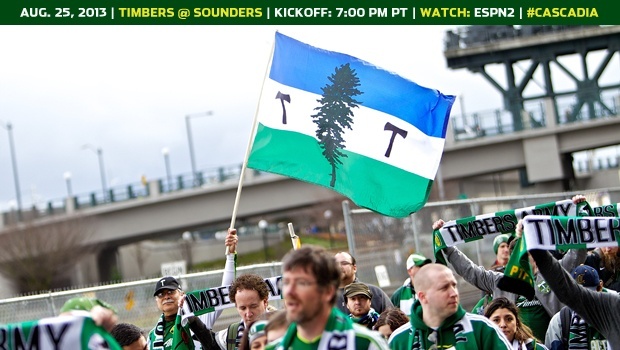 For Seattle it's their home-opener, of sorts, as Clint Dempsey makes his first start in front of his new home crowd. For Portland it is something to prove, to remain ahead of the Sounders and closer to the playoffs. For the league it's a seminal moment where their biggest rivals play in the biggest stage full of stars and a sellout crowd that rivals and surpasses most in the world. At halftime, on the pitch, Portland seemed like the better side. Diego Valeri's wonderstrike hit the woodwork and the Portland faithful held their breaths and closed their eyes in disappointment. Still zero - zero. For Seattle one thing was clear. Sharlie Joseph and Brad Evans in the midfield weren't allowing the width and pockets that Dempsey needs for his brand of magic. Eddie Johnson also looked a bit lonely out there even though he had a national team striking partner at his side. The second half was different. In what should have been the true starting lineup, Mauro Rosales came in for Seattle in place of Sharlie Joseph and changed the game with a perfect free kick lob that Eddie Johnson put away. Most of the second half was Seattle's. Portland seemed lost at times and Valeri rarely saw the ball and Nagbe was left alone to try kicks from long range. Valencia did not provide the necessary energy when he replaced Ryan Johnson and Will Johnson's presence was sorely missed. Seattle won tonight and so did the league. Dempsey may not have scored but he played, he his presence felt to the Timbers and to the newly-adoring fans. For the Timbers this was only their fourth loss of the season. Not a good time to start losing more games but with two games in hand compared to most of the Western Conference, this team still had plenty of chance to get their place in the post-season. The fans believe in this blue-collar squad and their young coach, Porter. It's not over yet for this rivalry since they meet On Sunday, Oct 13.